In Oklahoma, for each barrel of oil extracted by energy companies, seven to 10 barrels of wastewater are produced. Oil and gas companies use a technique called ‘dewatering,’ which allows a cheap separation of oil and water, making old geologic formations economic. The water, which sits underground for millions of years getting saltier and nastier with the passage of time, must be disposed of safely. Oil companies send it to disposal wells where it is injected deep into the earth. This disposal process has been linked to an increase in earthquakes because the injected wastewater counteracts the natural frictional forces on underground faults and, in effect, “pries them apart”, thereby facilitating earthquakes. Because of wastewater disposal earthquakes on natural faults are occurring faster than they would have happened otherwise. 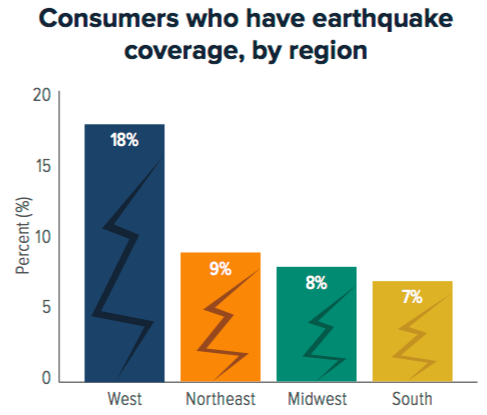 The spate of earthquakes in Oklahoma (Figure 1) over the past few years has driven earthquake insurance take-up rates in that state from 2 percent to 15 percent (higher than in California). 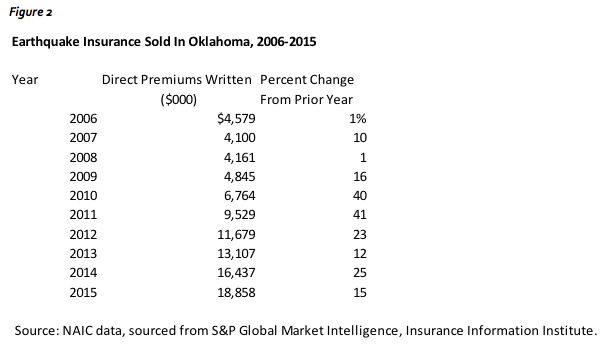 According to NAIC data from S&P Global Market Intelligence and the I.I.I., direct premiums written from earthquake insurance in Oklahoma increased by over 300 percent from 2006 to 2015 (Figure 2). The Oklahoma market has been declared noncompetitive as only four companies combine to write a 55 percent market share. The action gave the state Insurance Department the right to approve rate changes in advance. Some insurers suggested a better solution would be to encourage competition rather than increase regulation. Due to the volatile nature of the risk there is potential for insurance market surprises. Earthquake liability could harm energy prices and create an environmental risk problem for insurers. Some economists argue that housing prices could fall by nearly 10 percent following strong (MMI VI) shaking, which is not uncommon in magnitude 5+ earthquakes. Lawsuits over loss of value could get big fast. 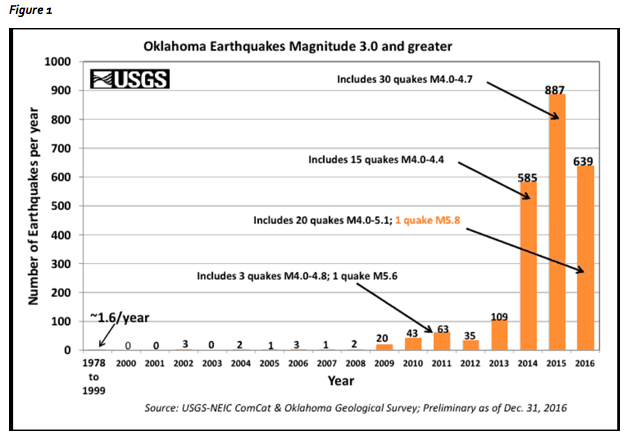 The 2016 Pawnee earthquake was the largest in the Oklahoma historical record with a magnitude of 5.8. One of the problems for insurers is that lots of wells are injecting so it’s tough to tell which company caused the earthquake. It’s also tough to tell if an earthquake has been induced since an induced earthquake looks the same on a seismograph as a natural earthquake. The USGS 2014 seismic hazard update is being incorporated into earthquake risk models now, but the update doesn’t contemplate induced earthquakes, which are now covered in USGS annual rate forecasts instead. In recent years, the rate of injection has fallen due to regulation in the form of a mandated 40 percent decrease in wastewater disposal in key earthquake regions, falling oil prices and new geologic targets which produce less water. And it looks like reductions in injection volume are reducing activity. However, some experts believe the damage has already been done. Above-normal earthquake activity may continue for several decades, with fewer but potentially stronger earthquakes. Oklahoma is a hotspot for earthquakes linked to wastewater disposal, but it’s not alone. Concerns in Texas led to the closing of a wastewater injection site near the Dallas-Fort Worth International Airport and there is evidence that some of the earthquakes that occurred in California decades ago may have been induced. Check out the I.I.I. issues update Earthquakes: Risk and Insurance.